The Cleanmaster HEPA Air Purifier is ideal for use as a Patient Isolator, helping to prevent the spread of airborne contaminants. Contaminating bacteria, spores and other microorganisms are carried in the airstream through an odor absorbing charcoal filter, then through an extended media prefilter. Final filtration is provided by a HEPA filter, 99.99% eff. @ .3 micron or larger which is tested according to accepted procedures as described by the Institute of Environmental Sciences (IEST) and/or ISO standards. 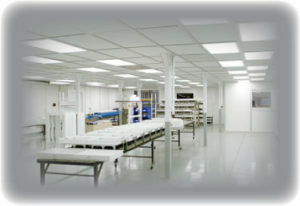 Airflow is controlled by a solid state variable speed control with RFI suppression and ranges from 450-600 CFM. 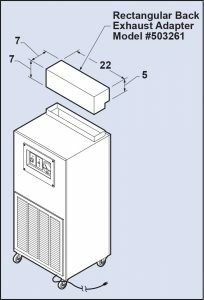 HEPA filtered air is exhausted out of the unit through a top mounted discharge grille or optional adapters are available for discharging air into a host building HVAC system. Model No. 16503 is equipped with a Germicidal lamp to help kill bacteria in the airstream. 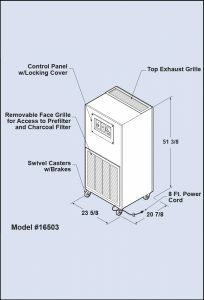 Units are powered by a 115 volt, 60 Hz, single phase motor and each unit features a solid state variable speed control with RFI suppression, a magnehelic gage for monitoring the filter condition, a pilot light and an eight (8) foot power cord. All the controls for the units are located under a clear tamperproof cover. HEPA Air Purifiers are equipped with four casters resulting in an easy to move unit. 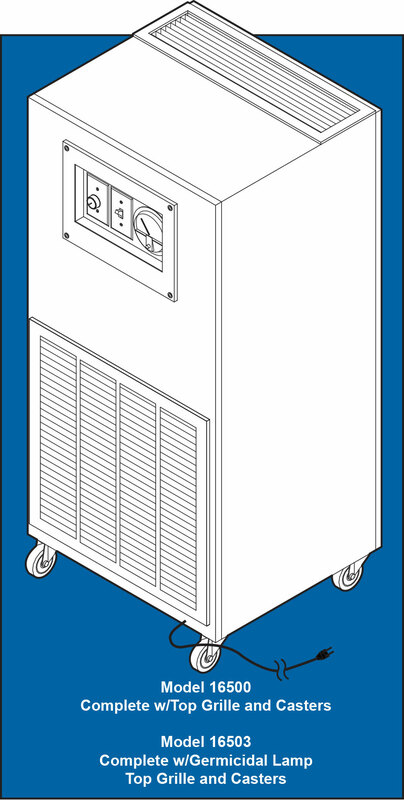 When the unit is placed in its preferred location, casters can be locked to prevent movement. 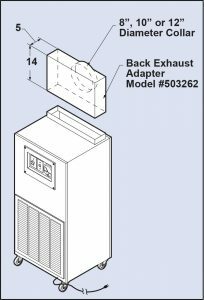 Prefilters are replaced by removing the front grille and the HEPA filter is replaced by removing the rear access panel. 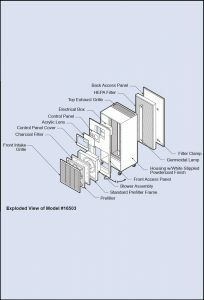 Housings have a durable white stippled powder coat finish and will blend into the décor of a hospital or healthcare facility.